BANAGAS continues to receive international recognition for its world class standards of occupational safety and health. During the year 2014, in recognition of its high standards of occupational safety the company was awarded at a ceremony held in Glasgow, Scotland, the Oil & Gas Sector’s Winners Award by the Royal Society for the Prevention of Accidents (ROSPA). The ceremony was attended by Dr Sheikh Mohammed bin Khalifa Al Khalifa, chief executive, and Khalid Ahmed, general manager – production. Banagas has also been awarded a prestigious International Safety Award, the International Safety Award with “Distinction”, from the British Safety Council which was received by Dr Al Khalifa, at a ceremony held in the UK in the presence of Khalid Ahmed. Banagas has also been awarded three other prestigious international safety awards, the Order of Distinction Award for Occupational Health and Safety from the Royal Society for the Prevention of Accidents (ROSPA), First Place, Division II, International Category and the Perfect Record Award from GPA USA. The company has also initiated a suggestion scheme, which is part of the company’s policy for continuous improvement by encouraging employee involvement in improving the quality of work, productivity, communication, safety, protection of the environment and cost saving. Mohamed BuRashid, general manager projects, in the presence of management staff and the suggestion scheme coordinator, awarded prizes to 40 employees for submitting 55 winning suggestions. As of September 2014, Banagas achieved a record 128,300 man-hours worked without a lost time accident since 27 May, 2002. This is an improvement over 2013, when Banagas achieved a record 9 million man-hours worked without a lost time accident. A company that processes highly flammable gases has to pay the greatest attention to occupational health and safety and right from the start of operations this has been of paramount importance. To safeguard life and property, Banagas enforces the most stringent regulations to ensure safe working conditions at all its facilities, following closely the health and safety standards of the international gas industry as a whole. Since the establishment of Banagas was in itself an environmental measure, solving the problem of associated gas that was flared and thus wasted for 40 years, the company has continued to set an example for its industry. Its established safety, health and environment policy includes a clear strategy to preserve the environment and safeguard the health and safety of all citizens, employees and contractors within its facility. 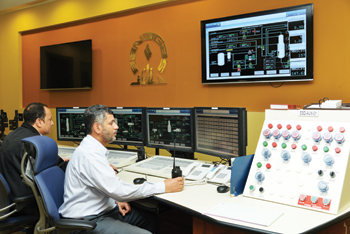 The board of directors of the Bahrain National Gas Company considers the occupational safety and health of its employees and the protection of the environment as one of their primary responsibilities. The company is committed to providing a safe and healthy work place for all employees and contractors working within the facilities and shall take all reasonable measures and precautions to minimise and prevent personal accidents, pollution, damage to property and the environment. Management of gaseous air pollution: In compliance with Ministerial Order No 3 for 2001, issued by the Ministry of State for Municipalities and Environment, gas emissions produced by gas turbines and gas dehydration units at compression stations and the main plant are regularly measured and reported to the Public Commission for the Protection of Marine Resources, Environment and Wildlife. Elimination of ozone depleting gases: Banagas was the first company in Bahrain to eliminate the use of halons in firefighting systems, replacing them with more environmental friendly ozone-protective products, pursuant to the resolutions of the Montreal Protocol to which Bahrain is signatory. Dedicated landfill for industrial waste: A dedicated landfill has been designated for disposal of hazardous industrial waste such as filters and carbon substances used in cleaning hydrocarbons from impurities. Procedures have also been developed for waste management and transportation to the industrial waste landfill designated by the Public Commission for the Protection of Marine Resources, Environmental and Wildlife. Elimination of items containing asbestos: A specialised committee has identified all spare parts containing asbestos and replaced them with environment-friendly substitutes. Forestation of the Sakhir area: In support of the national environmental protection campaign 2,000 trees have been planted in the Sakhir Area near the company’s facilities. This project has added a measure of beauty to the wild nature of these areas. Noise level controls: Noise is created by turbines, compressors, air-cooler fans and pumps. High noise areas have been identified as those where the intensity of sound reaches 85+ dB. Noise levels in the work areas have been reduced by using silencer partitions while high level noise worksites have been designated and provided with signs indicating the need to use ear protection. Hazop study: The company has developed a Hazard and Operability (Hazop) procedure for all engineering modifications which involves the application of a formal, systematic and rigorous examination to identify hazards and assess their potential consequences and risks to personnel and equipment. A Hazop committee is assigned the task to examining the process on the principle that a team approach to hazard analysis will identify more problems than individuals working separately. The committee is made up of individuals with varying backgrounds and expertise. The expertise is brought together during Hazop sessions and through collective brainstorming to stimulate creativity and new ideas. • The procedure covers all types of changes whether permanent, temporary or emergency. MOC review meetings are conducted on a regular basis by a technical team comprising members identified by change owner and the actioning department manager. Risk Based Inspection (RBI): A risk-based approach to inspection has been implemented by the company to identify the likelihood of failure and its consequences. RBI methodology is used to prioritise inspection, usually by means of non-destructive testing. Those with high probability and high consequence are given higher priority for inspection than those that are high probability but for which failure has low consequences. This strategy allows for rational investment of inspection resources. The company established the RBI programme to manage the inspection process for plant equipment especially pipelines and vessels with the ultimate goal of developing a cost-effective inspection and maintenance programme that provides assurance of acceptable mechanical integrity and reliability. Implementation of international standards: To realise its corporate objective to “provide a safe and healthy workplace and protect the environment,” Banagas adapted OHSAS 18001 Standard, an internationally accepted standard on occupational health and safety management systems and ISO 14001, an internationally accepted standard on its environmental management system to develop its integrated safety, health and environmental (SHE) management system. Banagas has been awarded certification for both standards. Liner system for weathering pits: Banagas is undertaking the provision of lining system for the weathering pits at the Central Gas Plant to ensure that the surrounding soil is protected from contamination. Fire drill competition: The fire drill competition takes place every year to test the firefighting skills of employees from industrial companies and Government Ministries in Bahrain. The event is supervised by the Civil Defense and Fire Services Directorate and takes place at their Riffa fire station. Teams of five compete against each other to carry out the fire drill with the winner being the one who completes the drill in the shortest possible time without incurring time penalties.